Running it twice has been around for years, but until recently, was only common at the highest stakes games in a B&M casino. However, that is changed because now anyone can choose to run it twice online at PokerStars or Full Tilt Poker. 1 What is Running it Twice? 5 Why Run it Twice? 7 So, Should I Run it Twice? The option to run it twice occurs when everyone in the hand is all in. For example, if there were three players in the hand and only one of them was all in, running it twice would not be possible. Also to run it twice, every player in the hand must agree to run it twice. If one person decides not to run it twice, the remaining community cards left to be dealt will be dealt normally only once. 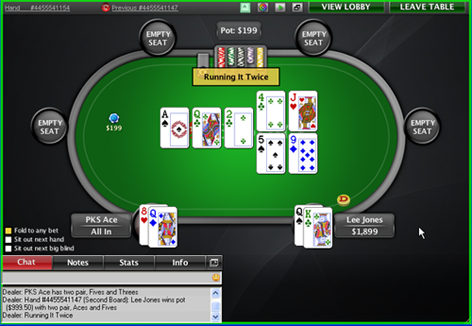 It is much more common for a hand to be ran twice between two players heads up instead of a multi-pot with three or more, although it’s still possible. When two or more players are all in with community cards yet to be dealt and all of them agree to run it twice, the remaining community cards will be dealt twice. For example, when everyone in the hand is all in preflop and every player has agreed to run it twice, the community cards will be dealt twice. 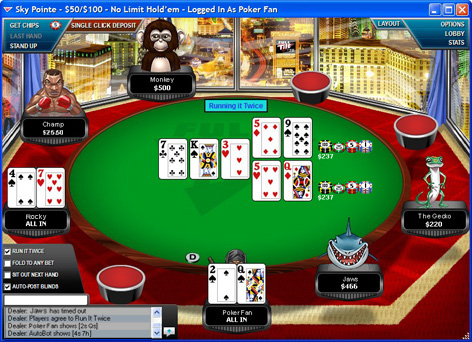 The first flop, turn and river will be dealt normally for half of pot and a second flop, turn and river will be dealt for the second half of the pot. Please note that only community cards are dealt twice and not hole cards. If the all ins occurred on the flop, only the turn and river would be dealt twice, not a new flop for the second board since the all in occurred on the flop. The same concept applies to the river. If players were all in on the turn and agreed to run it twice, only the river would be dealt twice. The first river and then another, each river with the four other community cards for half the pot. Ouch, so villain ended up hitting a queen and wins that board. Thankfully we held up on the second board. Because Villain won the first board, and Hero won the second, the pot would be split equally. If you’re playing at a casino, you have to first make sure the table you’re playing at allows running it twice. It’s rare for any stakes below $5 – $10 NL to allow this because it can slow the game down. If it is allowed, after you’re all-in you then have to verbally ask or agree to running the hand twice. The dealer will then confirm and deal accordingly. You can run it twice while playing cash games at No Limit Hold’em or Pot Limit Omaha stakes $.25 – $.50 or higher. * Just because you set this to Always doesn’t mean every all-in will be ran twice. It also depends on your opponent. Remember, running it twice is a mutual agreement. ** These options allow you to choose to run it twice at some of your tables, but not all. For example, if you’re playing one table of $50 NL 6-Max and want to run it twice, you can check the box to run it twice at this table. If you also have a $100 NL heads up table and don’t wish to run it twice, you can uncheck the box. You can run it twice while playing cash games at No Limit Hold’em, Omaha Hi, and HA stakes $.25 – $.50 or higher. To enable run it twice on Full Tilt, in the lobby navigate to Options – Table Options – Gameplay Settings… In the window that pops up, check the Run It Twice by Default box. You will now default to running it twice on all tables that allow it. You can also check or un-check the “RUN IT TWICE” checkbox on each open table. Before we list the reasons, it needs to be stated that running it twice is a 0EV move. This means it doesn’t affect your Expected Value whatsoever. So from a math standpoint, it doesn’t matter if you run it once, twice, three, or fifty times. Running it twice is simply a tool to reduce variance. It reduces variance because it splits the pot in half. Because of this, a $100 pot effectively becomes two $50 pots. So instead of winning or losing $100, it adds another possibility – you could win or lose $100, or win $50 and lose $50 (breaking even minus rake). So one benefit that becomes clear is you don’t need to be as strict with bankroll management. If you’re playing $200NL, instead of potentially risking $200 on one hand, you split your hand into two $100 stacks. But keep in mind this is only if your opponents decide they also want to run it twice! There is currently no way to tell who will run it twice on any given hand. Even if PlayerA ran it twice 10 hands ago there is nothing stopping them from disabling it for future hands. So ignoring bankroll management on these grounds is risky. Some other reasons players choose to run it twice is because it’s more exciting. Arguably the most exciting High Stakes Poker hands were when the pros were close and ran it out 3 or 4 times. It adds more drama and delays the final result. It may not be as exciting online, but it still adds an extra thrill, if that’s what you’re into. You might also want to choose to run it twice depending on the players at the table. If you know you’re sitting down with 5 other people who play “crazy” and like to play for stacks, running it twice may relieve some stress. Some reasons to not run it twice are because it can slow the game down and you end up seeing less total hands. There were some High Stakes Poker hands that ended up taking 10 minutes because of this! Of course this won’t happen playing online, but it still adds time to each hand. You also might not want to run it twice if you know the person you’re playing against is nervous about going all in. He may be more willing to make a call for his stack if he knows you will run it twice. You can use his fear to your advantage. There is a misconception that running it twice gives the hand that is behind in equity two chances to improve their hand. This is incorrect. Running it twice helps you realize your equity better than running it once. Let’s say you have AA and the villain has KK on a board of K 5 A K rainbow and you both go all in on the turn and decide to run it twice. There are 44 unknown cards, either in the deck or they have been folded. There is only 1 card coming and you have 1 out to win. Assume the pot is worth $1000. If you run it once you have 2 cards in 44 that will improve your hand so your EV = 1/44 = 2.27% = $22.70 in expected value. Now to map out what all the numbers mean in the run it twice example. 1/44 is your original equity, in that you have 1 wins out of 44 cards. 1 in 44 times you will win $500 on the first run earning you $11.35 in expected value. 43 out of 44 times you have the opportunity on the turn to win $500, 1 in 43 times as well as the 1/44 times you will never win the 2nd deal as you already won the 1st deal and cannot win twice. So we have determined that on the first run you will spike 1 in 44 times which will win you half the pot, $500, which puts your EV at $11.35 for the first deal. On the second run 43/44 times you will have the chance to win the second half of the pot of $500, 1/44 times you will have 0% chance to win the second half of the pot as you already hit the Ace on the first run. So 97.73% (43/44) of the time you have a 2.33% (1/43) chance to win $500. $11.35 (first run) + $11.35 (second run) = $22.70 EV which is equal to running it once. So as illustrated in the example above, running it twice is 0 EV tool to reduce variance. So, Should I Run it Twice? To put it simply, if you want to, sure! Running it twice is a choice every player needs to make for themselves. It comes down to your own personal preference. There are some reasons for and against it, mentioned above, so now you can make an educated decision. Will you run it twice? – Running it twice deals two of the remaining community cards after players are all in. – You can choose to run it twice online at PokerStars or Full Tilt Poker. – Running it twice is a 0EV move, meaning it doesn’t affect your expected value on any hand. – The main reason to run it twice is to reduce variance. – It comes down to personal preference if you want to run it twice. If you are looking at getting into the action and running it twice versus players from around the world, we highly recommend signing up at PokerStars. They are constantly improving their software, adding fun new features like this and offer top notch support. They also give all new players $600 free for making their first deposit with the bonus code STARS600. So if you don’t already have a PokerStars account, that includes you! Click here to visit PokerStars to create a new account or Download the official PokerStars software directly from FTR to save some time.